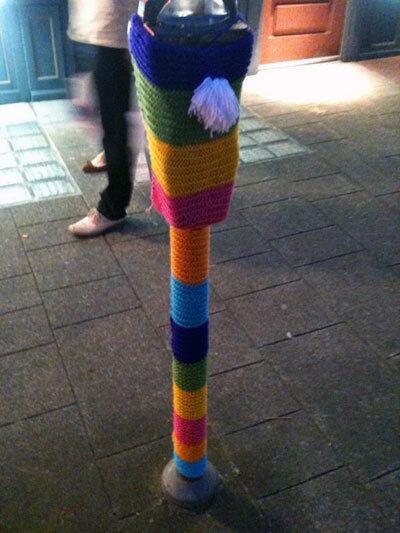 If Banksy could knit, he'd probably be a fan of Yarn Bombing. Yarn Bombing is the new term that I learned today. I'm not sure where I was when Yarn Bombing hit the scene, but a post on It's Nice That earlier this week alerted me to it. The post was about Olek, a Polish-born artist who uses crochet as her medium. 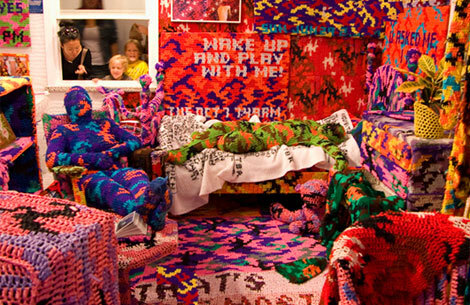 Currently showing at the Christopher Henry Gallery in NYC, Olek's bizarre artwork prompted me to take a closer look at Yarn Bombing. At YarnBombing.com (a blog written by knitters Mandy Moore and Leanne Prain) the tag line says it all, "Yarn Bombing: Improving the urban landscape one stitch at a time", or as it is referred to on their blog page, "knit graffiti". Much like Banksy or the Guerrilla Girls, Yarn Bombers go around making 'hits', but instead of spray paint or posters, they use wool, and lots of it. Yarn Bombing, which started in Vancouver, is now a worldwide phenomenon, and here are just a few examples of Yarn Bombing hits from the Yarn Bombing blog. This first is the creation of a Yarn Bomber known as Brifrischu, whose knitting playgrounds are in Aachen Germany and Nottingham, England. Here bollard creatures are known as 'FadenMonsters'. 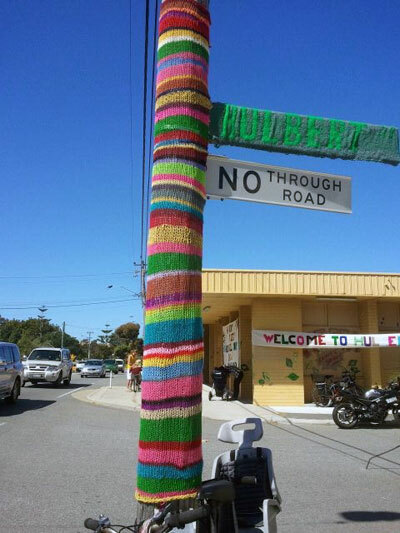 The above sign post creation comes all the way from Western Australia and could possibly be the work of local Yarn Bomber Captain Plaknit (check out the blog here). Apparently Captain Plaknit's skills have been called upon to Yarn Bomb an entire street for a festival in Perth, later this year. 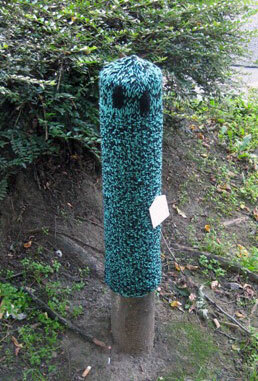 Our final peek into the world of Yarn Bombing comes in the shape of a wooly car parking meter. This hit was found in Chinatown in Vancouver although the creator of the work remains unknown. For more information on Yarn Bombing, and to see more crazy creations, visit the Yarn Bombing blog.